No idea where our Atlantian friend found this, nor do I know who the photographer is, but one thing I do know… I’m not trying this with TC! Should you be the taker of this amazing photo, two things… (1) Enjoy it, you’ll spend a lifetime trying to get another one of these, (2) Sorry I stole it, I’m known to do that from time to time. This entry was posted in PossumPosts and tagged all about the bird, art, birds in paradise, fun with birds, humor, Recreation, talking women, the bird's life. Bookmark the permalink. You are so wise not to try this on TC! I am sure you hang on her every word! Thanks for sharing the pic. Like you, I stole it for my collection! A wise thief… imagine that. 🙂 Blessings good friend. 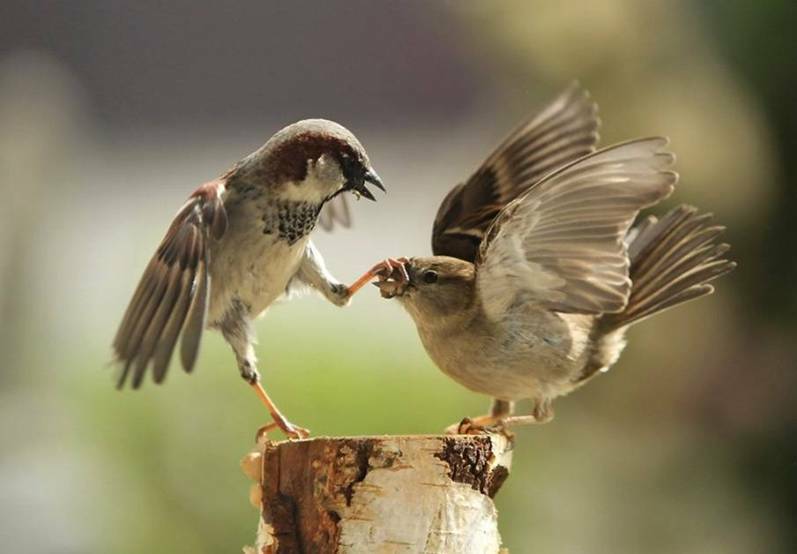 Hi Mike, all jokes aside, this picture made me wonder why this bird was so aggressive to the other bird and I found this interesting explanation to this birds antisocial behaviour and thought you may like to know too. It has been noted that when birds have been abused in the past, either by a mate or an owner they act out fear and aggressions on their toys or other feathery friends. This rarely happens in baby birds, keep in mind that not all were abused some are just aggressive, but there’s more chances of a shady past. If you notice that your bird is this way towards other birds it will be important to cage them alone, it will help reduce the stress for all your birds and yourself. Time, patience and love will be required to work through this and eventually your bird will feel more confident and safe around you and other birds and will settle down and it will have no need to hurt or abuse others. Birds who sing a lot are happy and adjusted, they are protective and mate well. Congratulations! Mike You have completed your crash course on avian body language. I hope you enjoyed it! But I’m sure Mike your not surprised, as we know it’s the same with humans, hurt people, hurt people so what’s the answer it’s the same, we Love them till they heal and feel more secure, then we Love them more. Wow! You are quite the bird master good friend. Great life-lesson to boot. Thanks and blessings good friend! I’m married, and I’m sure the beak kept moving.